HK1NA - StackMatches, RatPaks, SixPaks, Bandpass filters, Hamation Wireless Control Systems and more in a world-class contest station. All these stacks in this ever growing antenna forest use StackMatches. The 20 m 6/6/6 and the 40 m 3/3 are the only ones in South America. There are more antennas systems using StackMatches and RatPaks that can not be seen in the pictures. 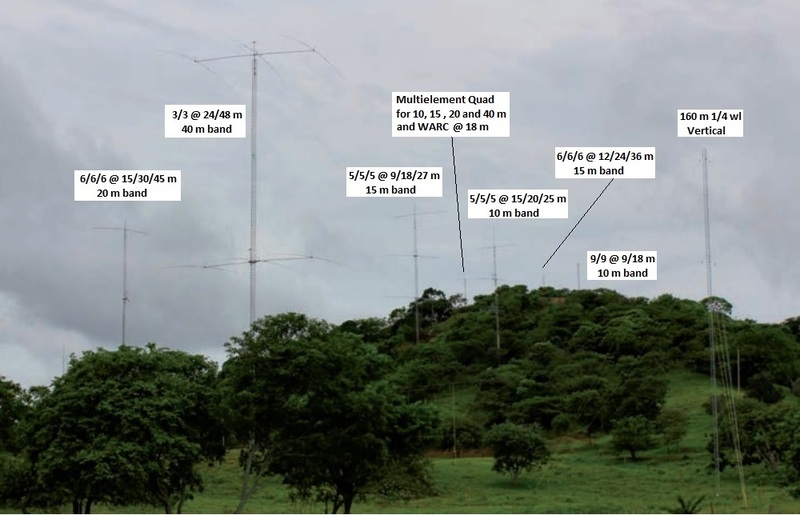 There are monoband sets of four Yagi-Uda antennas of five elements dedicated only for RX looking to the major contest population areas for 10, 15 and 20 m shared by two stations on each of these bands with SixPaks controlled by Hamation's Wireless Control System, saving thousands of feet of control cables and trenches. The longest link distance, but not its limit, at HK1NA is 700 m (2300 ft) (Please see: http://www.arraysolutions.com/hamation-wi-fi-control). Caribbean Sunset at HK1NA in Tubará, Colombia, South America. Top Two Antennas in the 20 m 6/6/6 stack, the only three-high in SA. The stack for 20 m: 6/6/6 on 48 ft (14.60 m) booms at 50/100/150 ft (15/30/45 m). Far right, the first 10 m stack: 5/5/5 @ 15/20/25 m. The tower for the 15 m stack (5/5/5) was yet to be installed between these two. 40 m 3/3 stack, the only one in SA. 5/5/5 @ 15/20/25 m for 28 MHz. 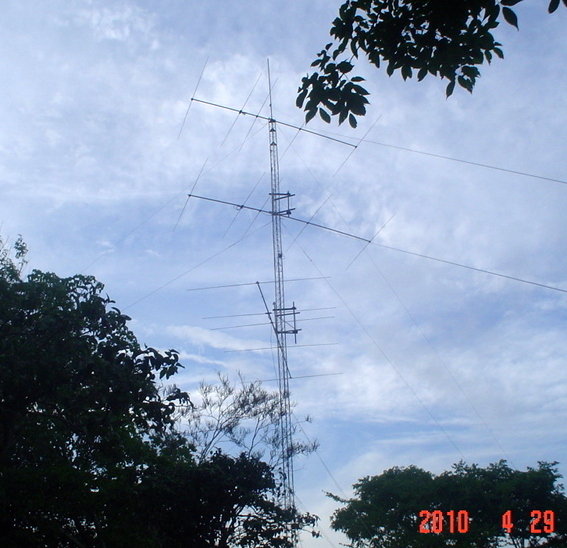 This was the first HF Yagi-Uda stack -ever- in HK-land. Fed initially with an exact half wave long CATV 75 ohm coaxial cable, because a good, long 50 ohm cable was not yet there. If it would have had a lower velocity factor, that half wave coax would not had made it from the StackMatch relay box to the tower base. A radio was installed at the base of the tower (see picture below) with a small generator and tuned down the lower end of the 10 m band, nothing heard, CQ's made, nothing, then on the SSB segment,... nil, nada, zero! 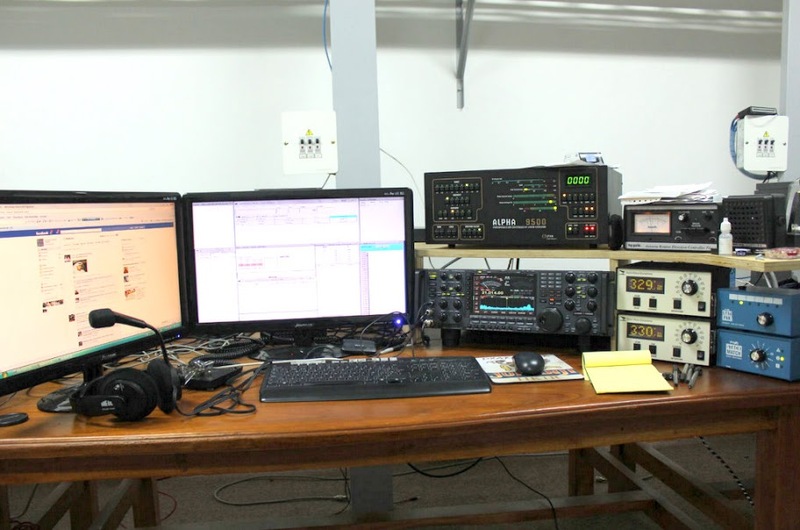 Because of the wide band characteristics of the OWA Yagi-Uda antennas, an excursion to the "aerial channels" of CB band was decided and there was a Canary Islands (EA8) station which was contacted. Then we realized that the band was open to EU and called by telephone to some friends in Spain, got them on the air and the first reports and QSOs were made. 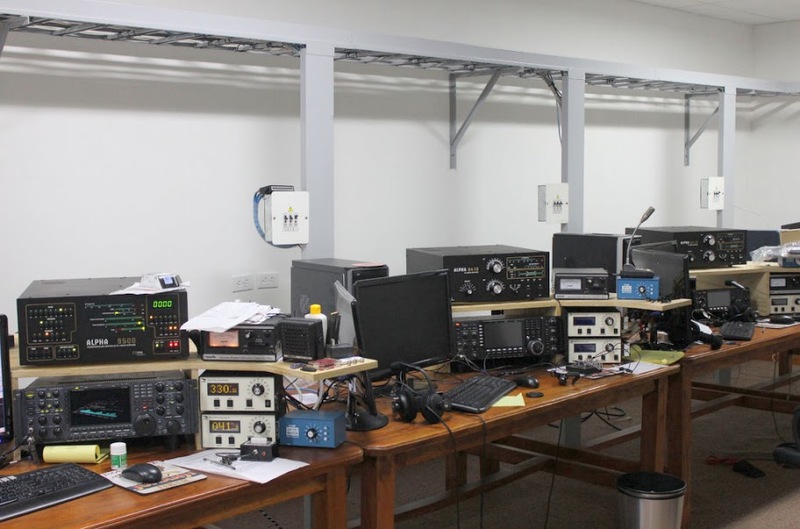 Interestingly, the first QSO ever made with an HF Yagi-Uda stack in Colombia was done on the 27 MHz band!!! 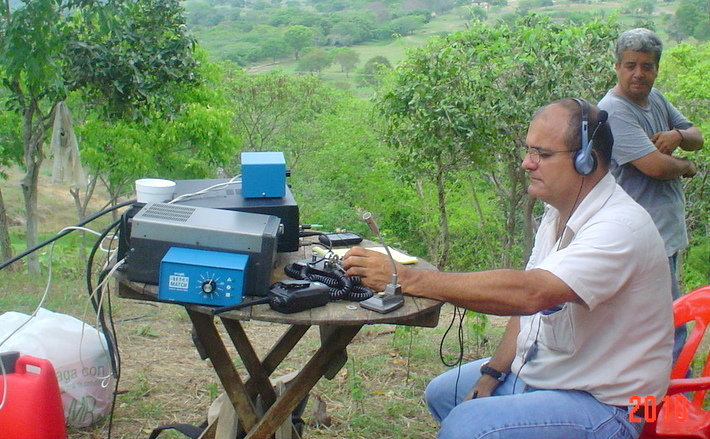 Jorge - HK1R calling CQ on 10 m CW to no avail, David - HK1A standing by... waiting for a "wow!". In the end, they had to QSY to 27 MHz. The 15, 20 and 40 m desks. These now have changed to a more compact layout with two stations per band. 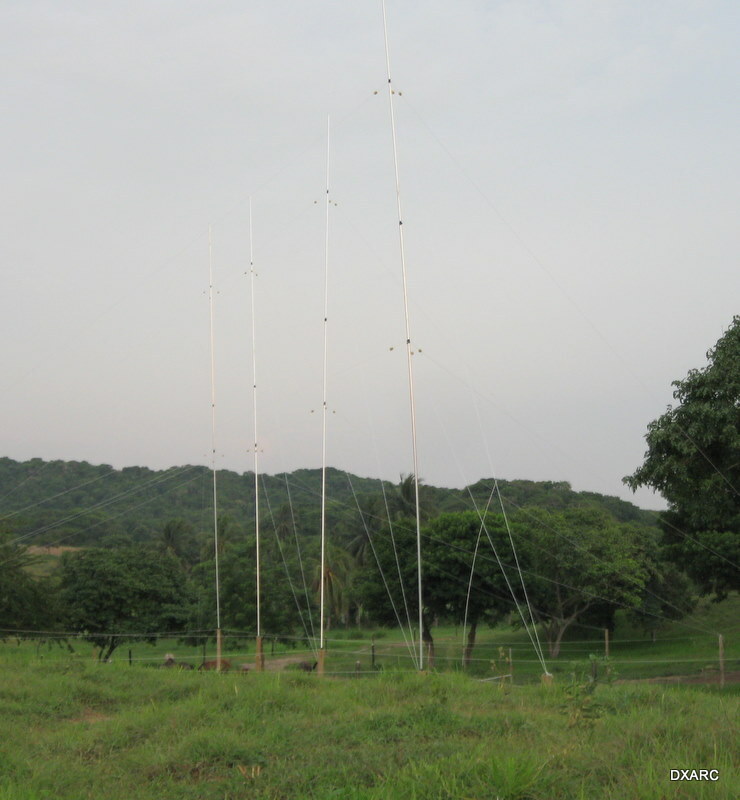 80 m Yagi-Uda four full-size quarter wave vertical elements looking to EU. 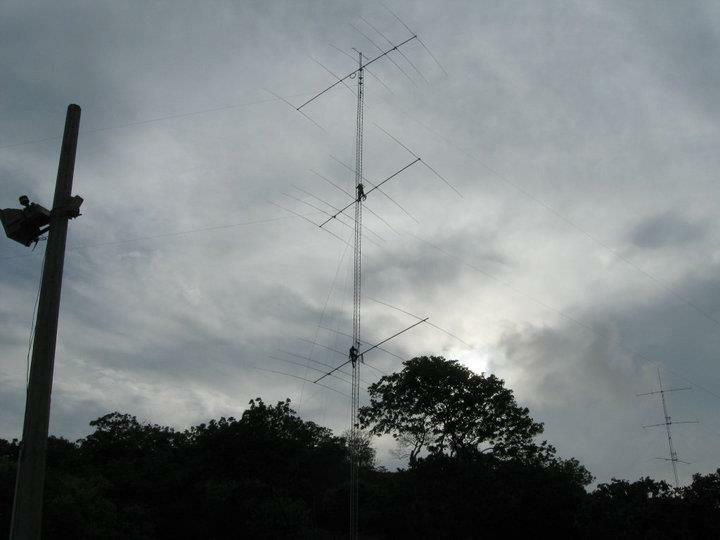 Closer view of one of the 80 m Yagi-Uda arrays with four full-size quarter wave vertical elements.